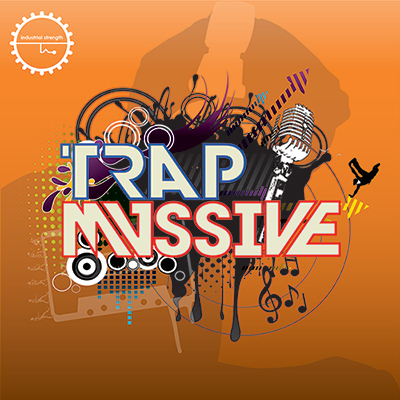 Industrial Strength is proud to present "Trap Massive", a stunning array of loops and NI Massive Synth presets that when combined are positively explosive. This pack captures the emerging sound of underground Trap like none before it. Made in Brooklyn, NYC, a mecca for new Trap Music and home to some of the best EDM, Hip-Hop and Trap producers to date, originators like Diplo, Baauer, A-Trak and more. Within this pack, all the flavors of Trap have been captured. The authenticity oozes from it like a hot grilled cheese sandwich. With a hefty 50 Native Instruments Massive presets, the sounds featured in this pack are groundbreaking and off the chain. All the quintessential Trap sounds supplied, including various booming sub basses and kicks, bells, horns and awesome effects. We've also created over 20 infectious lead sounds, everything from plucks and hits, to trill drills, to rising scooping leads to syncopated grooves. Also included, are sounds heard in songs like "Harlem Shake" and Skrillex's "Goin In" Remix, plus other great sounds that were inspired by producers like Lex Luger, Dillon Francis and Flosstradamus. If you are looking for those attention-grabbing main leads, these are the patches for you. And these sounds are excellent for not just Trap Music but any electronic genre; House, Electro, Dubstep, you name it. Use the macro controls to easily alter the presets at the turn of a knob. Containing over 800MB of audio, the possibilities are endless. Trap Massive comes fully laced with over 150 tightly programmed Drumloops and patterns all clocking in at 150Bpm, including the crispiest Snares, punchy Kick Drums, rapid Hi Hat loops, Crashes, Rides, 808 Percussion patterns, as well as the snap and clap loops that are sure to get people crunkin. Not to mention, 65 combo drum loops, plus fills and sequences needed for variation and climax. Providing those sharp off-beat Trap rhythms was crucial. The pack also comes with a whopping set of one shots. We've included Logic EXS24 and NI Battery 4 Kits to get your drum programming rocking in no time flat. The pack features numerous booming sub bass loops, and a bunch of enticing lead lines and melodic parts with Trappy grooves. Trap Massive also comes correct with rises and sweeps needed to accentuate your productions, plus other effects that are perfect for Trap beats, mixes or live performance. Much like Trap Massive's predecessor, Dubstep Massive, all of the loops in the pack can be mixed and matched universally. The 200+ Vocal samples being offered as part of this collection will add substance and character to your productions. Find exclusive bars and phrases from stateside MCs Elijah Divine and Throwback Sodapop, known for their strong delivery, and real subject matter. Many of these phrases we've screwed down so they're ready to be dropped into your session or sampler. Others are dry, for easy manipulation. In addition there are various female vocal bits--pre-chopped, something every electronic producer needs in his arsenal. These audio bits are great for throwing into a sampler instrument and creating glitchy melodic lines. Once again we've done this for you and included the Logic EXS24 kits. Finally, what trap pack would be complete without those iconic Trap chants that provide that extra oomph. We've covered all the bases with this bad boy pack. Time to get ya Trap on.